The Schrodinger Wave Equation was developed by Erwin Schrodinger and is ranks among the biggest breakthrough’s in the history of science. It serves as one of the pillars of quantum physics. The irony of the situation is that it wasn’t quite clear what the equation could be used for when it was first developed. It wasn’t known what the results actually meant however. Over time it became apparent that it was describing the location and energy of a particle in terms of probability. The time independent equation is shown below. In the beginning of last century it was postulated that particles behaved both like particles AND waves. Schrodinger was the first person to prove this mathematically. Before the quantum revolution particles were described as having definite locations and other characteristics. As scientists began examining things a bit deeper it became clear that this was not the case. The most accurate description of our universe, including subatomic particles, suggested that the physical characteristics of things should best be described as probabilities. For example the location of an an electron, proton, atom, or even groups of atoms are not absolute. Their probable location of anything is both non zero percent and non one hundred percent for every possible location across space and time in the universe. While there is a higher probability for the electron existing close to the nucleus of a hydrogen atom but there is also a probability, albeit small, for the electron existing on the surface of Proxima Centauri which is over 4 light years away. That possibility of it being on Proxima Centauri is very very very very small and highly unlikely to actually happen. An event such as an electron moving across a few microns or even a few meters is still unlikely but not so unlikely as to not occur. These events are known as quantum tunneling, or as lay people know it: teleportation, and will be covered in a future post. 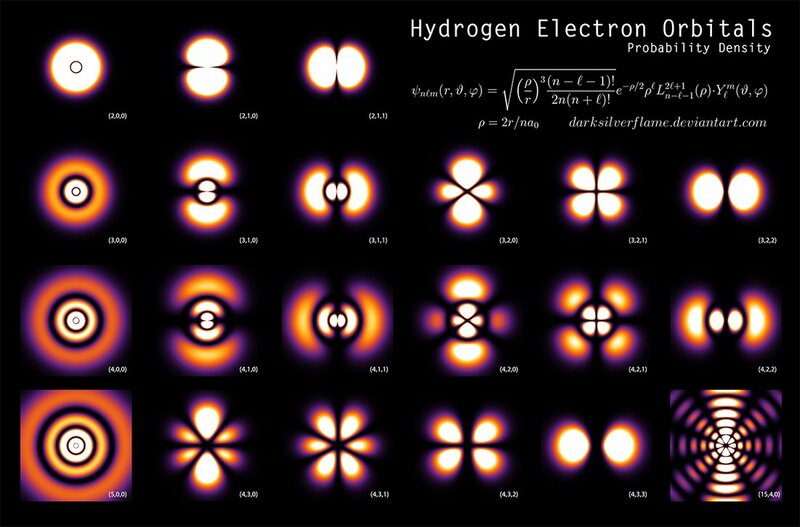 The picture below is a visual representation of the probability cloud of the various electron shells for the hydrogen atom. The bright areas are the areas of highest probability for the location of the electron and the darker areas have a lower probability of finding it but keep in mind although dark and unlikely there is a small possibility for finding the electron anywhere in the universe, no matter how much space and or time separate it from the nucleus. Let all of this sink in. I’ll expand on this in my next post later on in the week on the 4th of December! Until then may the force be with you!